He "threatened all us and the speaker vehemently". 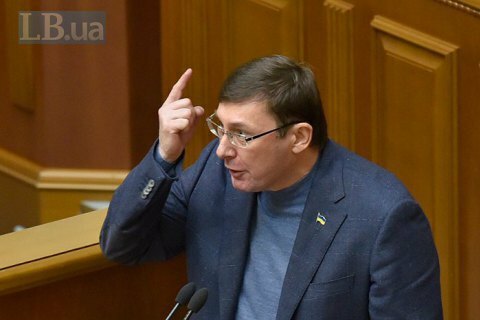 Prosecutor-General Yuriy Lutsenko told MPs as early as last night that he was going to tender his resignation. Sources told LB.ua, this happened at a meeting of a group negotiating the creation of an ad hoc investigation commission on the Kateryna Handzyuk case. It was chaired by speaker Andriy Parubiy. "We were there until 1 a.m. Prosecutor-General Yuriy Lutsenko was at the meeting. He threatened all us and the speaker vehemently that tomorrow (at the Tuesday session in parliament), he would resign if this ad hoc investigation commission is formed," one of the negotiators said. He did not want this commission to be created because "it would be unreasonable and at least put a scope in the wheel of the entire investigation". He was also afraid of the commission being used to "pour dirt a gallon a week" on the Prosecutor-General's Office ahead of the 2019 elections. According to the sources, the exchange was emotional but many found Lutsenko acting too hard. By 6 a.m., the speaker persuaded the meeting that not creating the commission would entail bad reputational consequences for all sides.